Many people are impressed with the coloring of the Nile Crocodile which is an olive green. There are also plenty of spots on it that are dark black in color. They feature different shades of yellow, gray, and cream on the belly and around the flanks too. All of this offers them plenty of ways to hide out there in their natural environment. It is also a primary reason though why they are heavily hunted in order to create leather goods from. They range in size from about 11 feet to 18 feet as full sized males. The females are from 7 to 13 feet. It seems that in certain regions they tend to grow much larger than in others. It is sometimes a matter of what they feed upon. However, it is also something that involves the climate around them. When they live in water areas they tend to grow to a bigger size than those in cooler regions. There are some fascinating things to learn about the Nile Crocodile. First, they are able to hold their breath for a couple of hours without any damage to the body or brain. They can stay under the water for about 30 minutes without the need for any are. They can also slow down their metabolism when food is scarce. As a result a large sized crocodile may only need to eat few times per month to survive. If you were to travel back into time, you would find the Nile Crocodile to look the same as it does today. They have always portrayed a body that is perfectly designed for their needs. Even as times have changed and they have had to deal with various elements it has given then more than enough for survival. Many fossilized remains have been found that date back millions of years. These are what have been used to give credit to the idea that evolution hasn’t touched crocodiles in general including the well known Nile Crocodile. It can be interesting to view some of these early findings in books or online. There are some peculiar behaviors associated with the Nile Crocodile. First, they have what appears to be tears streaming down their eyes. Legend has it this is the females crying for the young they have lost so soon after they emerged from the eggs. They aren’t really tears though but a type of solution the body creates to help them cleanse around the eyes. Since it is very hard for them to move around on land they are mainly seen in the water. When they do spend time on land they have to crawl on their belly. This tends to use up a great amount of energy though. It may surprise you to discover just how vocal these crocodiles are. They are said to make more sounds than other species. Many sounds have been recorded by experts. They still aren’t sure what all the different pitches of grunts and roars are for though. However, many of them are linked to protecting their territory as well as calling out to find a mate. The warmer the temperatures happen to be the easier it is for the Nile Crocodile to survive. They are found living in bodies of freshwater including rivers, marshes, and lagoons. They have populations in areas of Somalia, Ethiopia, Egypt, and Kenya. These crocodiles also do very well in captivity so they have been placed in such facilities throughout the world. It is amazing at how many days they can go without food. They will consume food daily if they can get to it. However, it may be a feast or famine situation for them based on the time of year it happens to be. During the drought season there is less water for them to hide in. When the rainy season comes along and there is plenty of water animals will come to their habitat to drink. They are opportunistic when it comes to feeding so they are often seen consuming a variety of different things. Their diet can include insects, birds, and a variety of rodents. They can consume fish, and even large mammals. Depending on where they live that can include cattle, gazelles, wildebeest and zebras. 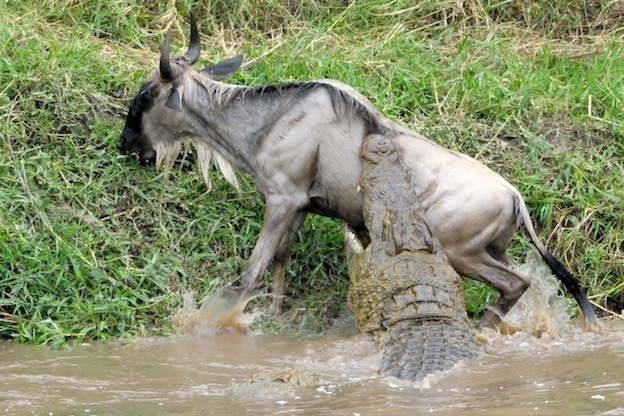 Wildebeest attacked by Nile Crocodile. Size tends to play the biggest role for the Nile Crocodile when it comes to them and mating. The females are often ready when they are about 6 feet long but for the males it can be when they are about 10 feet long. On average they will get to that size when they are approximately 10 years of age. In the months of November and December is when the females are creating the nest to place their eggs into. In the areas where this particular species lives, this time of year is known as the dry seasons. She can lay a very large number of eggs so the size of her nest reflects that. She may lay only about 25 eggs but it is very possible that she can lay as many as 80 of them. It will take about 90 days before the young begin to come out of the shells. She will spend as much time around her nest protecting it as she can. However, she may become too hot from the sun and need to enter the water to cool off. She will also need to eat from time to time and she has the best chance of getting her prey in the water. However, as the time comes for them to hatch she will be able to sense it. She will remain with the eggs as the young start to make sounds. Using her teeth she can crush the shells without injuring the young inside. She will take groups of them to the water with her mouth. Even being exhausted she will then return to the nest and repeat her actions for the next set of young. These Nile Crocodiles are very good caregivers from the start. It is shame though that only about ¼ of her young will survive the first few days of life. Even less of those that remain will be able to make it to adulthood. As they get larger though their chances of survival continue to increase. 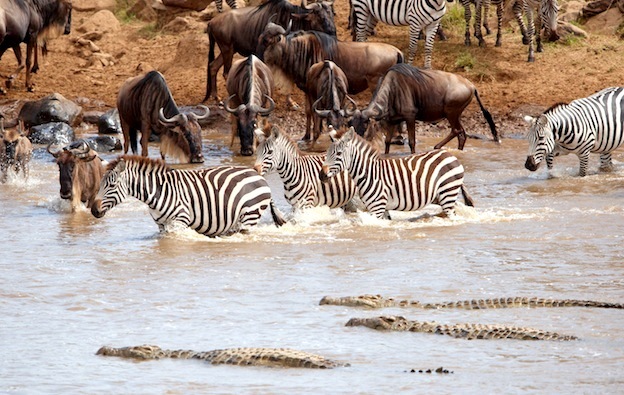 There are a variety of predators out there that will consume the smaller crocodiles. This includes birds, felines, and even other crocodiles that are very hungry. The biggest problem for these animals though are humans. They have a habitat that continues to be taken away bit by bit. This makes it harder for them to survive as they normally would. They are often hunted in many regions to provide a source of food for the villagers in the area. These poor people also make money by taking hunters on safaris to find the Nile Crocodile. For thrill seeking hunters this is one of those adventures they can hardly say no to. The main reason the Nile Crocodile is hunted though is for the hide it offers. Money can be earned by selling those hides in order for them to be made into various types of leather goods.